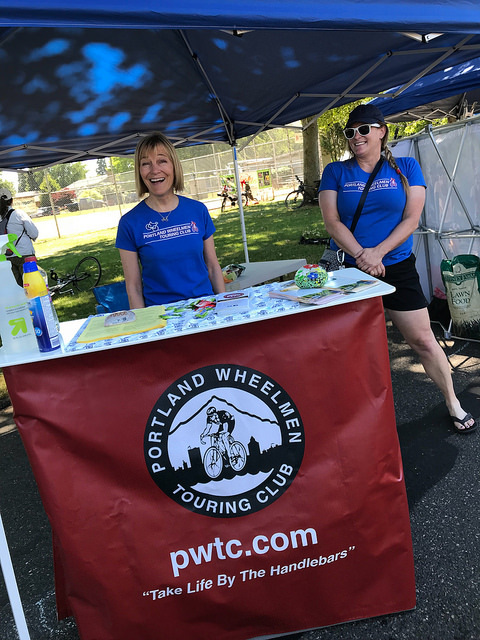 Club members Ann Morrow (left) and Kathleen Hellem at a recent Sunday Parkways event. What do you think of when you hear the name Portland Wheelmen Touring Club? Established in 1971, this is the oldest riding club in the area with a proud legacy of leading (daily!) group rides, raising funds for non-profits, and putting on great events like the Pioneer Century. As they approach their 50th anniversary, PWTC is doing some soul-searching and club leaders say a name-change is a very real possibility. In a note to members in their November newsletter, the club’s Board President Chip Kyle wrote, “The board believes that — with great trepidation – we need to reexamine our club name and how it represents who we are, what we do and how we want to grow.” The reason? The current crop of members is getting older and the club isn’t attracting new, younger riders. “We have seen that participation in our club rides comprises predominantly retired males,” he wrote. Kyle also says, despite having many active women members, they’re frequently asked if women are allowed to participate. The Portland Wheelmen’s annual Pioneer Century ride is coming up soon, Saturday, June 6th, to kick off the summer road riding season. This is one of the most popular road rides of the year — last year’s Pioneer Century drew over 1,200 participants. The Pioneer Century is a very flexible ride. The usual route is a 55-mile loop through the Canby-Molalla areas, with a challenging climb up the Cascade foothills to Kokel Corner. 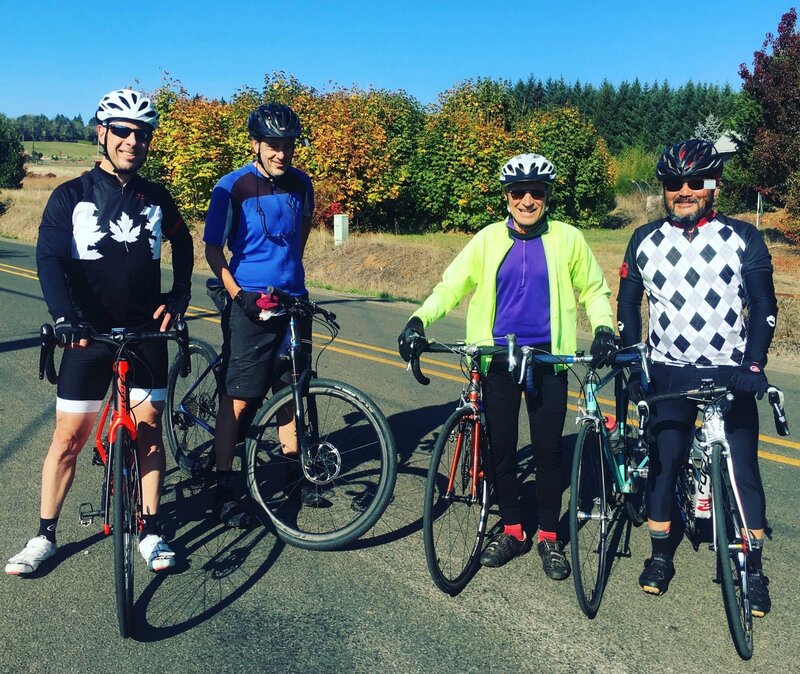 The second ride option is a very rural and scenic 45-mile loop, from Canby to Champoeg (pronounced “shampoo-ey”), out to the Willamette and back. Do the whole century by riding the 55-mile loop through Molalla first, then riding the Champoeg loop. New to this year will be a shorter, 32-mile route through Canby and Molalla, without the climb up to Kokel Corner. Beautiful rural Oregon with only 1000ft of elevation gain — you won’t even notice that you’ve gone uphill! If you’re feeling ambitious, you can also follow-up the 32-mile ride with the Champoeg loop for a three-quarters century ride. The ride starts at around 9am from the Clackamas County Fairgrounds in Canby (south of Oregon City); the course opens at 7am, and riders depart around 9am. Breakfast is being provided by Bob’s Red Mill; lunch and raffle prizes are being provided by Chris King. Online registration ($25) is open now at the Wheelmen’s site, and your cheerful author is probably going to get the very awesome souvenir socks that are available too. 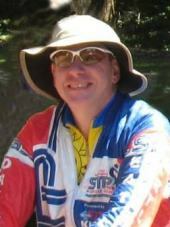 The Portland Wheelmen Touring Club are rallying support for Keith Ticknor, who suffers from a brain tumor, with a benefit ride and a Christmas tree sale on Saturday. Ticknor has been member of the club for nearly three decades and one club member described him to me as “the quintessential excellent volunteer without whom many events could not succeed”. Treatment for his brain tumor has put Ticknor out of work for months and his family (wife and three kids ages 7 to 12) is in a precarious financial situation. The Wheelmen hope the ride and tree sale can help bridge the gap until he’s back on his feet (and pedals). You can read more about Ticknor and the ride on the Wheelmen’s website.